Thank you, Sandra. I recently read an article titled, “Where’s Your Dream House?” in Woman’s World magazine’s June 13 issue. Perhaps you read the same article. One gorgeous scenic image jumped out at me—a beautiful, clear river running toward a snow-capped mountain in the distance. Yes! That’s where my dream home would be. Among the other choices were a beach, the country, the city and the suburbs. I don’t know about the perspective part but I’m certainly an introvert! But the article made me think about the books I write—the part I love most about my stories is the setting. Writing novels set in places like southeast Alaska (my Mountain Cove series) let’s me spend all that time enjoying the setting, at least in my head. I’ve always been a daydreamer, and if I’m not living somewhere then escaping to an exotic location in a novel set in such a place is the next best thing. When I’m searching for a new novel idea, I almost always look for the setting first. As readers, I’m guessing that’s not necessarily what you look for first when deciding whether you want to spend the next few hours or days with a novel. If it’s set in a place you’d love to see, then that might catch your interest, but you also want action, adventure and intrigue. Throw in some romance and you’re all set. 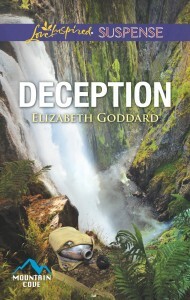 That’s exactly what you’ll get in Deception, the 6th novel in the Mountain Cove series. Thanks for having me, Sandra! And thanks for joining me, Readers! Me again. My pleasure, Beth. Readers here is the back cover blurb for Deception and some more info about Beth. Jewel Caraway thought she’d left her mistakes in the past—but then her past arrives at her door. Though she’s thrilled to reunite with her estranged sister, something about her sister’s new husband makes Jewel uneasy. Does he know her secret? Is he the one behind the growing list of attacks against her? And if he is involved…does that mean her sister is, too? With nowhere else to turn, Jewel must rely on police chief Colin Winters—the first man to make the widow question her resolve to never love again. But will he stay by her side when her guarded secrets are revealed? Elizabeth Goddard is the bestselling, award-winning author of more than twenty-five romance novels and counting, including the romantic mystery, THE CAMERA NEVER LIES–a 2011 Carol Award winner. She’s a double finalist in the 2016 Daphne Du Maurier Award for Excellence in Mystery/Suspense for her books BURIED and BACKFIRE in the Mountain Cove series. 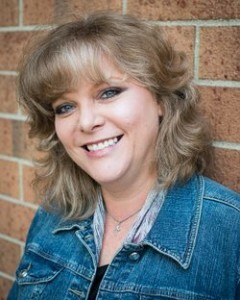 A 7th generation Texan, Elizabeth graduated from North Texas State University with a Bachelor of Science in Computer Science and worked in high-level software sales for several years before retiring to home school her children and fulfill her dreams of writing full-time. She currently makes her home in Minnesota with her husband and children.